The first half of Mad Men‘s final season (season 7) is set to return to TV on April 13th. Are you a “Mad Men” follower? I’ll admit it, I don’t want, but I have followed the women’s iconic styles over the years. Their styles have definitely changed for season 7, given the fact it’s set in 1968 and 1969. I’ll have to do a follow up post featuring those psychedelic styles. To get you ready for season 7, here are three women from the show featuring their early 1960s styles, with three very different tastes in clothing and how you can Get the Look from online retailer eShakti. eShakti offers feminine styles and absolutely amazing vintage inspired fashions. But what’s amazing about them, is they can be customized for your body type. You heard me right. Are you built more like Mad Men’s Joan who has curves? Or maybe you have Megan’s legs? Whatever your body type is, eShakti can help. Get the Betty Draper look. Trapunto stitched trim layered over spring checks create a lovely texture on our swingy full-skirted dress. Our tailored, spring-ready dress with a fitted top and flared skirt is cut from a washed floral print cotton that covers the swingy silhouette. Joan is known for showing off her curves. She has them and she shows them! Joan wears form fitting dresses that hug the bust and hips and cinch the waist. Here are a couple of dresses from eShakti that I can definitely see Joan in. Sleek seam details and a high-waistband refine the shape of our chic floral sheath, working to visually slim the silhouette. Cut a striking silhouette in our stretch-jersey dress, in a deep shade of green and a loosely draped overlay from one shoulder. Megan oozes confidence doesn’t she? She’s also a glimpse into what we’ll see style wise in season 7. This is an example of those psychedelic prints I was talking about. She’s also not afraid to show some leg! We’ll also see more of that in season 7 from the ladies. When it came to the late 60s and 70s, women were getting brave with color, patterns and showing more skin. Here are a couple of dresses that celebrate color and print like Megan does. Contrast blocks and vivid florals pattern our ultra-feminine print dress accented with a slender, waist-defining contrast trim. Contrast print blocks detail the sweetheart neckline and banded high waist of our mixed print chiffon dress fashioned with a flattering, corset-inspired bodice and a flirty cutout back. Which of these three ladies do you relate to the most? I’m definitely a Betty when it comes to style and dresses. Give me a feminine floral floaty dress and a cardigan and I’m one happy girl. 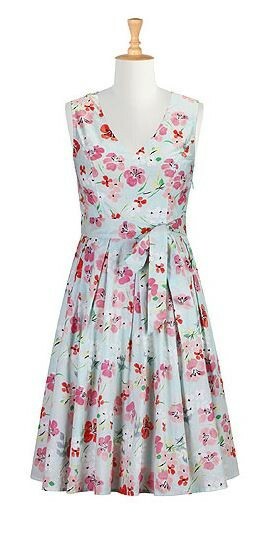 In fact, that Floral wash print sash tied dress is now officially on my wish list.